I will keep a running list of changes and additions here. I haven’t updated this post in several weeks but plenty of updates have occurred on the site. 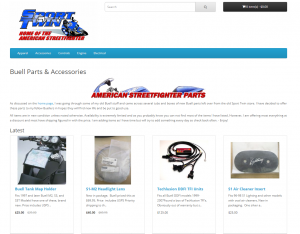 Many new products in the store, more docs including a ton of D&D dyno runs, an exhaust shootout and more. As I keep finding more parts I realized I needed a more robust storefront so I setup a full tilt store here. Added more Buell product. Tshirts, Air cleaner inserts, S1 dash and more. Created a simple store and added the Techlusion TFI units. Moved all of the .eps (Adobe Photoshop) files to my Gdrive which is good because it will give you a visual preview of most of the files. I also added logo files from 2001. Added some more high res model photos to various albums from 2001 from a Buell CD as well. Moved all Buell docs to the Gdrive and added 2005 model year specs in .pdf. Added quite a few new .pdf docs, SB’s, tech, marketing including a Buell History doc. Also added some Fuell Magazine articles about the XB suspension to the Misc docs section. Uploaded a ton of Buell avatars/icons. Added email subscription form in sidebar so you can receive updates when I add or change something. Uploaded the Buell 2005 CD with raw images, video and music along with an .iso image ready to burn to your CD and the CD cover artwork. Added Buell and related .eps files from a factory CD. Added photos from Thrills in the Hills.